I'm very excited today as this is going to be my first (UK only) GIVEAWAY here on my blog! And yes, I did shout that. 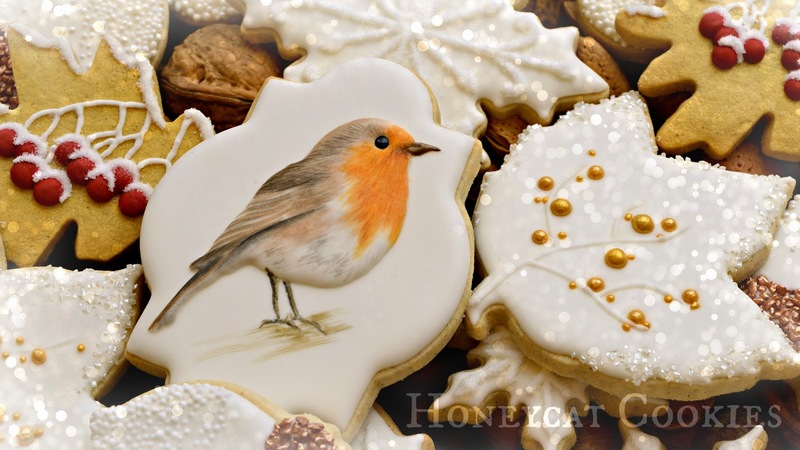 I created one more set of my Rustic Robin cookies, in order to film how I painted the little robins, and write a new tutorial for my 'What's New, Honeycat?' feature over on Cookie Connection. 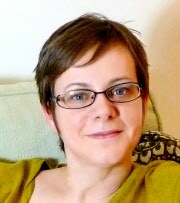 (To see the whole collection, just click on the badge in the sidebar). ...and it struck me that I've been muttering occasionally about a giveaway from time to time over on my Facebook page, as all you lovely people who have been joining in and following me over there (you do follow me over there don't you?) might have noticed, and wondered 'whatever happened to that idea?' but politely kept quiet about it. Oh, and that isn't all, there's that VIDEO I mentioned! Well, have a look at how I painted that sweet little robin, then imagine yourself biting his sugary little head off. It could be you! For much more detail on the process of handpainting cookies, make sure you head to Cookie Connection and read the TUTORIAL! Ok, that's enough shouting, here's the video. I'm afraid this giveaway will have to be limited to the UK only due to my insurance restrictions. Also, these cookies are fresh now, carefully wrapped and so will remain good to eat for quite a few weeks more, but I wouldn't want to risk them sitting for six months in the global postal system! But don't worry, I'm putting together a little collection of some of my favourite things, and will have an international giveaway in a while. Just fill in the Rafflecopter entry form below and I will contact the winner for their UK address, and pop the cookies in the post to you! Giveaway ends Monday 19th January 2015 12am (ie Sunday midnight). Please remember UK ENTRIES ONLY - I can't send cookies outside the UK (subscribe to my blog so as not to miss my international giveaway coming up soon). 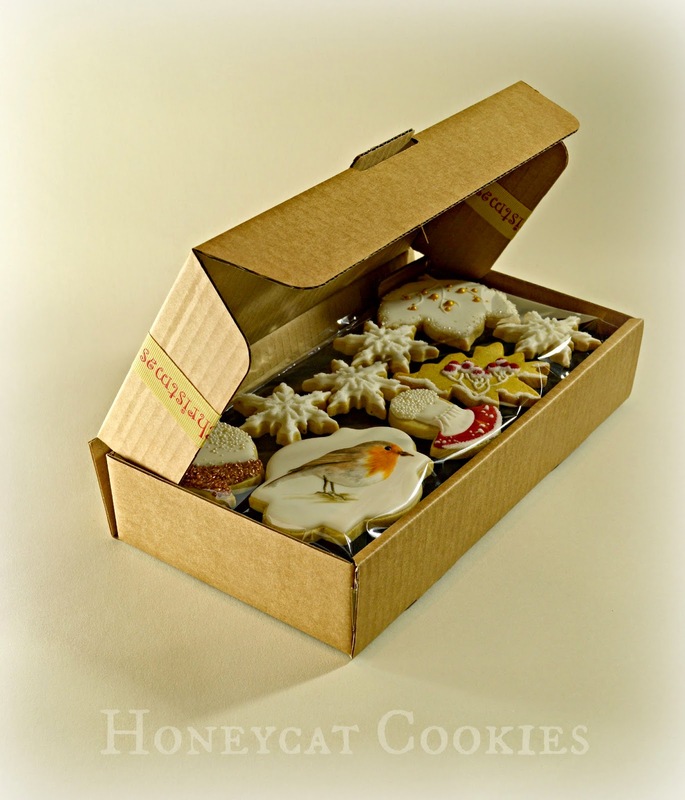 As well as using the widget, if your comment doesn't show up, please comment directly on this blog post - tell me what you'd like to see Honeycat Cookies make! I shall make sure the draw is taken fairly by cross-checking all the entrants. Thank you. Terms and Conditions: UK only. The winner will be chosen at random. 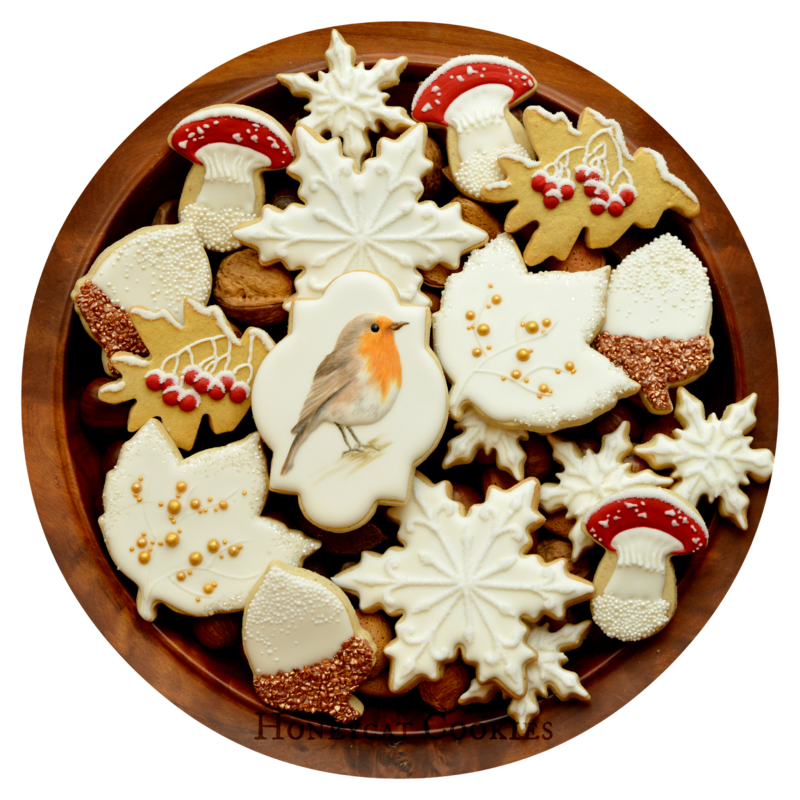 I will send one box of cookies in the design shown in these photographs to the winner of the giveaway, entirely free including free P&P, within 3 business days of being provided with a UK postal address by the winner. I will announce and email the winner on Monday 19th January 2015. 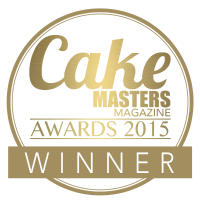 If I have not had a response with a UK postal address from the winner within 3 days of emailing I will pick a new winner. No cash or product alternative. I cannot be held responsible for loss or damage in the post. The ingredients are as listed below, please check carefully if you have any concerns about allergy or food intolerances. Ingredients: Wheat flour, Sugar, Butter, Cornflour, Royal Icing (Powdered sugar, Dried Egg White, Anti-caking Agent Tricalcium Phosphate E341), Egg, Lemon Juice, Vanilla Bean, Salt. Food Colourings, Lustre Dusts and Flavourings; any or all of the following: E422, E1520, E551, colours E153, E133, E122, E104, E129, E124, E153, E155, E102, E110. (E122, E129, E102 and E124 may have an adverse effect on activity and attention in children). Allergy Advice: Contains whole egg and wheat. May contain traces of nut: all products are homemade in my kitchen, where I both store and cook with a variety of nuts.